The NZ Transport Agency and Auckland Transport (AT) are creating a shared path for people on foot and on bikes from Merton Road near Glen Innes Train Station to Tāmaki Drive - allowing you to walk, run or cycle from Auckland’s eastern suburbs to the Waitematā Harbour. The path will be seven kilometres long and about four metres wide. The path is being built in four stages to ecognise the different consenting and construction challenges of the project. The first section of the project (from Merton Road to St Johns Road) was completed and opened in 2016. This update is to bring the local community and people across Auckland who are interested in the project, up to speed on progress with Sections 2, 3 and 4. The path was originally set to open in 2018. However changes to the route (for Section 4) as well as other delays mean the path is now due to be completed by 2021. The Transport Agency and AT are committed to the project and are working as quickly as we can to secure statutory approvals and funding to provide great outcomes for the community and other partners and stakeholders. Working with the community and people who will use the path is important to us. Please see the bottom of this newsletter for ways you can find out more or contact us. Starting at the intersection of St Johns Road and St Heliers Bay Road, Section 2 travels through Pourewa Valley, past Meadowbank Train Station to Ōrākei Basin. The valley’s topography and environment have presented technical challenges and access constraints. In determining the route, we have sought to create a path that follows the contours of the land, provides ease of use and accessibility for people of all abilities, while minimising earthworks and environmental impact. Where are we at with Section 2? The route planning is fully complete. We have used the feedback to help finish the detailed design of the path and this is close to completion. Once the full design is complete, we will share this on the AT website. We are working through a small alteration to the designation, securing resource consent and land owner approvals. We are working on the construction planning. Once underway, it will take about two years to construct this section of the path. Plans are in place to start construction by the end of the year (2019) subject to statutory approvals and funding being in place. How are we working with the community and stakeholders at the moment? You can read the consultation report for the community engagement we carried out in late 2018 for Section 2 on the AT website. We are meeting regularly with the Ōrākei Local Board who continue to provide valuable input into designing the path. We are talking to people who live close to the route where we want to offer them a privacy fence or planting because the path is near their house, or their property may be impacted by construction and we want to let them know more about this. We are working with other groups and businesses in the area such as the iwi, Meadowbank Pony Club, Purewa Cemetery, Auckland Council, Watercare and KiwiRail to ensure that all of our planning is in place to be able to start building this section of the path. As our plans around construction become more detailed we will continue to talk to the people, groups and businesses who will be impacted by the construction. There will be changes to the intersection at St Johns Road and St Heliers Bay Road to make it safer to travel between Sections 1 and 2. The landings will be longer and more widely spaced than Section 1 to make the journey more pleasant. The shared path will cross the KiwiRail and Watercare access roads located at the basin end of the path. This means that we will install a bollard to prevent unauthorised vehicles accessing the path, use markings and surface treatments to indicate the shared path and install signs to alert path users and maintenance people of each other’s presence. We are working through what the signage will look like but it is likely that it will include some sort of illumination when it is activated by vehicles crossing. The path will be made of a mix of concrete bridges and boardwalks and a mix of post and wire fences, no fence or balustrades with handrails. Next to the rail corridor there will be some fencing to keep people off the train line. The team is still working through the designs for the balustrades and we will make these public once they are finalised. You often give us feedback asking us to build as many connections to the path as possible. We understand that getting on and off the path, especially around schools and transport hubs, maximises the number of trips that the path can be used for. While connections to the path are not in scope for the project, we are working with other teams at AT and Auckland Council to ensure that the path can accommodate future connections. Section 3 of the path connects Section 2 to Section 4 and involves widening the Ōrākei Basin boardwalk to four and a half metres. of the environment. There were concerns about the height of the balustrade at 1.4 metres and the thickness and design of the slats which didn’t allow people to see the lovely views very well. The Transport Agency agreed to change the design and there were several rounds of public consultation about this. The new balustrade (pictured above) is now being manufactured and the whole boardwalk will be finished by mid-2019. The balustrade is made from a mix of wood and metal, and at 1.2 metres high will be both safe for people on bikes but offer people on foot a better view of the surrounding area. The path will be lit at night by down-lighting in the handrails. The new GRP (fibre reinforced plastic) decking for this section that has been partially installed seems to be working well for the community and we have had some good initial feedback. We also propose using this decking, which is very durable and provides a great non-slip surface, on some parts of Section 2. What is happening to the old balustrades and timber decking on Section 3? The original wood balustrade can’t be relocated as too many of the planks were rotting. The wood is being re-purposed. The new partially installed balustrade will be used on another project where it fits in better with the surrounding environment. 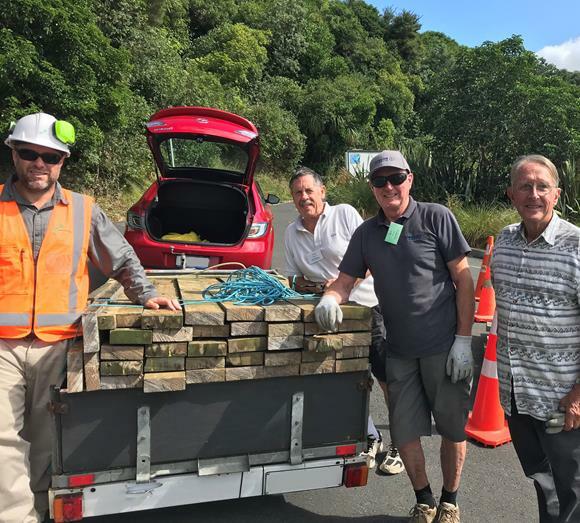 The Transport Agency and AT are glad that we have been able to donate the wood from the timber decking for re-use in the community, including to Men’s Shed who will use it in community projects. Photo shows Claudio from the project team with Men’s Shed team members – Paul, Bob and John. The route for Section 4 starts at Ōrākei Basin, near the Ōrākei Basin Village development, runs next to the Ōrākei Road Bridge and follows the eastern edge of Hobson Bay on a structure completely separate to Ngapipi Road. It joins Ngapipi Road south of the boatsheds in the area of Whakatakataka Bay and provides a safe connection to Tāmaki Drive at the Ngapipi Road intersection that is now controlled by traffic lights. Where are we at with Section 4? We have an initial (specimen) design for the path, taking into account feedback we received during the 2017 consultation. We are preparing to lodge a notified resource consent application to build the path. We are talking to people who own properties and businesses who will be impacted by the path, in advance of lodging the resource consent application with Auckland Council. Anyone can be involved in a notified consent process so you will have a chance to have a say. For this section of the path, the duration of the consenting phase will depend on feedback submitted to Auckland Council during the consent process and any other council conditions. Section 4 consenting (timeline subject to public feedback within the Auckland Council consenting process). Section 4 award detailed design and construction contract (once consent granted). Sections 2 and 4 complete.